The effect of that heart shape is lovely, very clever. It doesn't look anything like a flying machine now. I know Iris has talked about it being a "heart", but I have been looking and looking at the examples, and I just can't see it! Maybe that is to be expected,very often I can't see what is right in front of my nose! 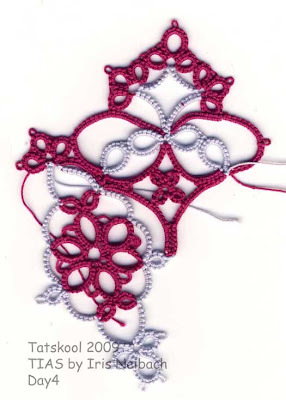 I am waiting for the tatting to magically unfold in front of me. Told you I was hooked!! The day that's in it! !